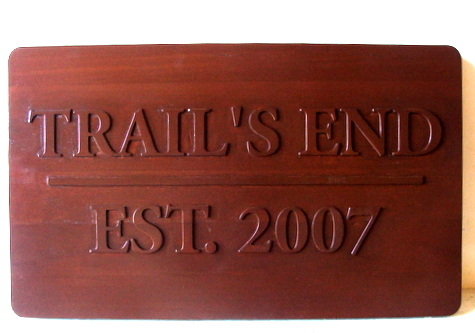 M22018 - Stained Redwood Name Sign for Cabin & Property Name "Trails End"
This beautiful stained redwood cabin name sign is simple yet impressive. The text and border are elevated. The entire sign is given two clear-coats to protect it from UV radiation and the weather. This sign can be mounted on a door, a house wall , on a post , or hung from a wood or iron hanger.